A connoisseur's dark ale with a malty, nutty complexity and layers of flavour. bottle. Poured clear deep brown with red hue, fluffy beige head. Aroma of dark fruit and roasted malt. Medium bodied, smooth mouthfeel with low carbonation. Highly malty flavour, burnt roasted grains, with raisins and treacle notes, a touch tart. 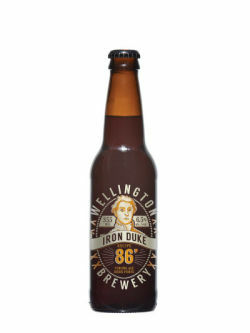 355 ml bottle from the Welly Re-Booted Mix Pack Voll. 3, purchated on Febuary 1, 2018. Dark ruby brown, small head. Sweet berry flavor barley aroma, quite juicy. Smoky fruity malt taste, nice wood notes, light dry finish. Like a good wee heavy, but without the high alcohol, I can't believe I've never tried it! Part of Reboot mix pack #3. Pours an average size frothy tan head that dissipates to a thin layer. Has a fairly dark amber appearance. Weak lacing. Aromas of toasted malts, a little woodsy, subtle spice notes. Flavours of roasted barley malt, strong dry fruit notes like raisins and plums. More spice notes but somewhat faint. Quite a lot of bitterness in the finish. Slight warming mouthfeel, also slick and sort of oily. Not too bad. Bottle from 4-pack sampler. Pours a deep chestnut brown. A very chewy ale. There's a lot to sink into with this one. Dark sugar, a hint of rum, & stone fruit. A nice crispness despite the sweet character of the style. Hops are bitter but not abundant & I usually crave more but it's kind of ok with this brew. Good stuff. Brun öl med lätta inslag av rött. Beige skum. Doft av kola, karamell och malt med lät fruktighet. I smaken tillkommer en lätt nötighet. Reviewed from notes. This was poured into a snifter. The appearance was a dark brown color with a one finger white foamy head that gently dissipated to leave a light somewhat foamy lacing roaming along the glass in a slight trickling sort of fashion. The smell started off with a rich nuttiness eventually allowing a light vanilla and then an intruding chocolate with a decent booziness. The taste took all of those flavors and combined wonderfully. On the palate, this one sat about a medium on the body with a decent sessionability to it. The carbonation finishes slightly harsh and its got a deal boozy vanilla aftertaste. Overall, this was a pretty good offering that I would have again.